School leaders in England are concerned at the new way the government is assessing students' progress. They say the "contextual value added" measure - already being used by Ofsted inspectors - disadvantages schools with previously high performance. The CVA will also be one of the main ways schools are compared in this year's league tables. Ministers have said it is "strong and robust" - but they are going to "refine and improve" it during the year. The way CVA is calculated is highly complex. It involves adjusting pupils' test results by taking account of such things as gender, ethnicity and poverty. 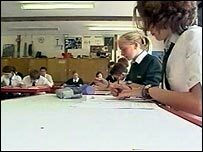 The general secretary of the Association of School and College leaders, John Dunford, told BBC News it was the latest example of the way ministers "thrash around from year to year" as they were "desperately trying to find a way to make the tables more acceptable". He set out his members' concerns in a letter to the school standards minister. "Any accountability device which depends on a rank order is ultimately self-defeating," he wrote. "It cannot be a valid aspiration for our school system that every school is better than all other schools (or 50% of other schools, or whatever). "This produces the reductio ad absurdum that all schools do equally well, achieve a value added score of 1000, and are graded by Ofsted as 'satisfactory'." Dr Dunford added: "It is our strongly held conviction that the CVA - or indeed any other single measure - is not strong enough to bear the weight of accountability being placed on it. "In particular, it cannot be acceptable to you or to school leaders (and I know that it is not acceptable to senior Ofsted staff) that inspectors arrive at schools and say 'Your CVA [report] prevents me from grading your school higher than x.' But this is happening." In reply the minister, Jim Knight, said CVA provided a real opportunity for a "fair, consistent and transparent" measure of school performance. It was "strong and robust", he said. But it had to be "as accurate and sensitive as possible". He was therefore "determined that we continue to refine and improve" it - drawing on a pilot version in last year's secondary school tables and a similar one being carried out this year for primary schools. He also said: "I accept that no test or examination is 100% reliable." It was well known that some pupils would perform better or worse than their "true" level of attainment on any particular day. But at school, local and national level these effects balanced each other out so test results were a good indicator of overall performance, he said. Mr Knight said that - in light of head teachers' concerns - Ofsted had stressed to inspectors that performance data "should inform, but do not determine" their judgements. It would continue to "review and develop" this guidance.